The test allows to measure alcohol by volume (ABV) in beer, which is an important quality parameter. 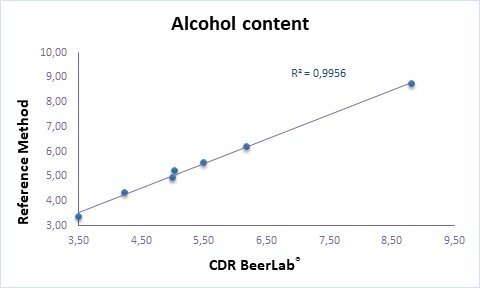 The analysis with CDR BeerLab® facilitates very much carrying out the quality control related to alcohol content in the beer produced. Alcohol by Volume can be measured using CDR BeerLab®, a system which enables you to carry out a wide panel of chemical analyses on beer and water, using a single instrument, in a process that is faster and simpler than traditional methods. Samples were analysed for Alcohol using both the CDR BeerLab® and the UKAS accredited gas chromatography (GC) method (Campden BRI Method AM/0 18 based on IOB Methods of Analysis, 1997, 9.10). Ethanol, in an alkaline environment, is oxidized through an enzymatic reaction and converted in acetic aldehyde in presence of NAD+, which in turns produces NADH. The increase of the absorbance, measured at 366 nm (end-point), is proportional to the concentration of ethanol in the sample. Code *300730 – The kit, designed for 100 tests. Code *300735 – The kit, designed for 10 tests. Use on beer or wort. Make a dilution of the sample 1:100, for which you can use the dedicated kit. The beer sample needs to be degassed (we recommend to use an ultrasonic bath) before making the dilution. For higher accuracy in the analysis of wort we recommend to centrifuge the sample. Alcohol by Volume (ABV) was last modified: February 19th, 2019 by CDR s.r.l.